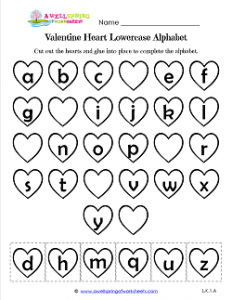 Here’s a Valentine heart worksheet that will keep little hands busy. Kids cut out the hearts with the letters in them at the bottom of the page. Then they repeat the alphabet and glue in the missing letter. Make sure they don’t lose their letters! They can cut one heart out and glue it on, then cut out the next one and glue it on. Or they can cut and put them in a nice little stack. No matter how hard you try, there will be some that are sure to end up lost or on the floor. When kids are done, they can recite the alphabet from beginning to end.